Follow Greta! 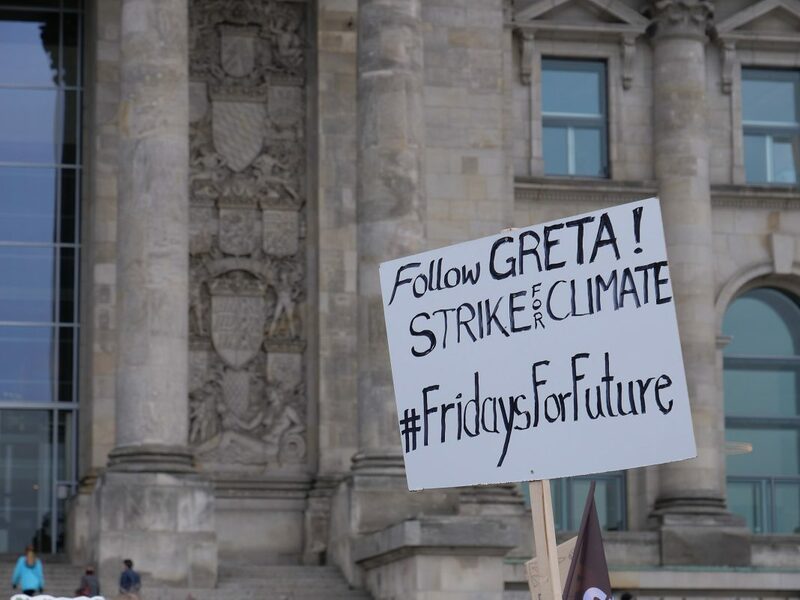 Strike for climate, placard, December 14, 2018, Berlin, Germany. The European Economic and Social Committee (EESC) discussed the key role that organised civil society must play for a real “rEUnaissance” in Europe during an event on 21 February 2019 – just over 90 days from the European elections – that brought together the highest representatives of the European institutions and civil society organisations from across the entire EU. The EESC president, Luca Jahier, referring to growing Euroscepticism, xenophobia and racism across Europe, said that democracy was under attack and that European values were being questioned. “This is not the time for resignation, it is the time to dream and to dare,” he declared. “The 2030 Agenda is a win-win situation, it sums up the efforts of all of us and focuses in particular on youth, sustainable development and civil engagement. It is the economic and social contract for the 21st century.” The EESC has a key role to play: “We give voice to the thousand faces of ‘Europe at work’, we have to make sure that this dialogue will never be compromised. The worst thing would be to remain silent, we have instead to make the voice of the ‘good ones’ heard,” he continued. “Whatever it takes, we will dare a sustainable Europe,” he exclaimed. “We need to protect the biosphere, the air, the oceans, the soil, the forests,” pointed out 16‑year‑old Swedish climate activist, Greta Thunberg, who made it clear that it was imperative to take action now against climate change. “Our political leaders have wasted decades through denial and inaction. They do not want to talk about the climate crisis, because they know they cannot win this fight, they have not done their homework. Not only do we need new policies, we also need a whole new way of thinking. Our political system is all about competition: you cheat when you can, because all you want to get is power. This must change.” Mentioning the data from the latest UN reports, she warned that our planet was only some 11 years away from an irreversible situation. “We are not fighting for the future of young generations only, we are fighting for everybody’s future. We have started to clean up this mess and we will not stop until we are done,” she concluded. The “Civil Society for rEUnaissance” event was organised, on the one hand, to draw attention to Articles 2 (European values) and 3 (objectives of the EU) of the Treaty on European Union and, on the other, to mobilise civil society at all levels in the run-up to the European elections. BusinessEurope Director General Markus J. Beyrer, ETUC Secretary General Luca Visentini, Solidar Secretary General and Co‑Chair of the Liaison Group Conny Reuter participated in the debate, among many other speakers including Madeleina Kay, the ‘EU Supergirl’.